What naturally follows a week of perfectly good weather at the US Open? Well, of course a semmingly interminable bout of rain. For this blogger, the best thing about the rain is that I've been able to catch up on sleep and this long delayed post will still be relevant when I wrap it up. While Mother Nature gave this writer a well-timed breather the players, especially those in the bottom half of the men's draw, may not feel as refreshed by this unscheduled break in the tournament. At this point, we're straddling the Round of 16 and the quarterfinals, there are 12 men left in the tournament of the 128 who've entered. With a week behind us and a week's worth of tennis in front of us (no matter how few days the remaining matches are crammed into), we re-look at the men's draw and do some revisionist predictions. Defending US Open champion Rafael Nadal gets a break in drawing Luxembourg's Gilles Muller in his round of 16 match. It's not that the 28 year old Muller can't play; he was a quarterfinalist here back in 2008 and famously stole Andy Roddick's mojo at Flushing in a massive 2005 upset...the same year he beat Nadal at Wimbledon. That said, Muller is one of only two unseeded players left and he'll be facing an inspired Nadal, who began rounding into form with his 3rd round win over David Nalbandian. Look for Muller to put up a fight early, but Nadal will come through with the W. He's not going to lose this match at this tournament to this guy. The indefatigable Spaniard, Ferrer, takes on one of the three remaining Americans, Andy Roddick in the Round of 16. Ferrer has a 5-3 record against Roddick (4-2 on hardcourts) including a tight straight sets win in Roddick's backyard of Austin, Texas in the Davis Cup earlier this summer. A wrist injury limited Ferrer's summer activity to that Davis Cup tie and a few rounds at Cincinnati. Roddick also played an extremely limited schedule due to injury and illness this summer causing the perennial top tenner's ranking to dive to clear out of the top 20. Both men are in need of a win, especially Roddick. The problem is the American plays sometimes erratic first-strike tennis, look for the steady Ferrer to move on. I know, I know, Donald Young beat Andy Murray in straight sets this spring in Indian Wells. The young American (pun...OK maybe intended) also eliminated 14th seeded Stan Wawrinka and 24th seed Juan Ignacio Chela last week, so sheer numerology would indicate that 4th seed Andy Murray will be his next victim, right? Maybe...scratch that, no. Donald Young has had an excellent US Open, this in fact may be the run that turns his career around and vaults him into the Top 40 (maybe even higher). On the other hand, this is a very different Andy Murray than the one Young felled in the Californian desert. This Murray isn't moping (as much), he's coming off a win in the Cincinnati Masters (defeating Djokovic in the final) and he's got an outside shot at winning this Open. Bare minimum, seeing what a deep run here did for Djokovic last year and knowing that he's reached his peak years, Murray knows this is an opportunity he has to take seriously and take now. There will be a few spectacular rallies, but this match is on Murray's racquet. He'll get past Young. One of the biggest men on the tour, 6'9" John Isner will play Gilles Simon, the man with arguably the skinniest calves on the tour. The thin Frenchman has had the better career thus far peaking at 6th in the rankings versus Isner's 18th. They've both won twice this year, Simon taking the title at the diminshed, but still 500 level Hamburg event and in Sydney, while Isner claimed two summer titles on the grass of Newport and the inaugural Winston-Salem tournament. This is a bit of a tough matchup to call, there's no head-to-head history. Isner wins 77% of his first serve points, shocking I know; while Simon converts 45% of his break point opportunities and wins 42% of return points. In other words, as inpenetrable as Isner's serve can often be, when Simon gets a crack at it, he's likely to break. As much as I'd love to say the big American will get a quarterfinal slot, I just don't see it in the cards. Simon is as steady as they come and after opening the year ranked 42nd has silently climbed back onto the precipice of the top 10. Those are heights that Isner has yet to climb. While I won't say Isner can't do it at Flushing, I think the Frenchman is going to have a bit too much variety to fall at the hands of Isner's power. Serbian national hero Novak Djokovic takes on Davis Cup teammate and newly minted Top 20 player Janko Tipsarevic in a match that's sure to have all of Belgrade (and much of the non-Serbian tennis world) buzzing. When friends, practice partners, Davis Cup teammates or doubles partners play each other, the results always seem to defy bloodless "on paper" calculations. These players know each others' games, psyches and weaknesses better than any other competitors could ever hope to, so throw the results out the window, this is about here and now. Even more than ATP rankings points and oversized checks are at stake in these matchups, these are a matter of personal pride. I mean, the best way to become a hero is to take down a hero, no? Djokovic and Tipsarevic have played twice, Tipsarevic, the elder of the two, has never beaten his countryman at the ATP level, but both of their contested matchups have gone the distance. Tipsarevic has never won an ATP title and at 27 his window is presumably closing, but he's posted a career best ranking and a career best major performance with this US Open quarterfinal appearance so he's surging coming into New York. Tipsarevic is a man in search of a statement win. Djokovic on the other hand has the air of an untroubled soul. As close as Alexandr Dolgopolov was to putting Djokovic a set down in the Round of 16, the World No. 1 smiled, stayed the course and eventually found his way off court in three sets. Tipsarevic will put his all into this match, this would be a win that would make him immortal (even if as a footnote in tennis history). With all of that on Tipsarevic's side, Djokovic will still come through. It will be closer than paper would suggest, but it will go the way of Djokovic. Roger Federer's career on court earnings are about ten times those of Jo-Wilfried Tsonga's. He's also won 67 titles to Tsonga's five. In fact, Federer has 789 ATP match wins to 171 for Tsonga, yet head-to-head Federer only leads four wins to three. It's hard to believe Tsonga is 26. He's spent so much down with injury that you almost lose sight of how long he's been a professional player (since 2004). Interestingly, Tsonga has only won a set against Federer in matches that he's won. Tsonga has ousted Federer at the Canada Masters and Wimbledon this summer and could well do the same here. If his match with Mardy Fish is any indication, we shouldn't worry if Tsonga gets off to a slow start. As soon as I was convinced he was just playing out the string, the big Frenchman broke deep in the fourth set and then swept to the surprising victory in five. Federer dropped a set earlier in the tournament to big hitting Marin Cilic, but otherwise has been in stellar form, for example, embarrassing 36th ranked Juan Monaco, 6-1, 6-2, 6-0 like he was late for a midnight feeding. It's hard to know what to expect from Federer, but Tsonga's another big hitter and he has recent momentum over the 5-time champion Swiss. Will he score the upset? I'm putting my chips on the Tricolore here. Tsonga for the win. When Andy Murray and Gilles Simon first met on court in 2007, France's Simon won in three up-and-down sets. Since then, the Scot has reeled off seven consecutive wins, only dumping one set. So why should this quarterfinal be any different? Well, it shouldn't. Simon is in a lot of ways a lot like Murray. He's a crafty, steady player who uses his court sense to turn the game to his advantage. Murray, however, has done the hard yards in the gym upping the ante on physicality so that he can hold his own against the power players and dish out a little extra muscle on his own shots. Simon will do his best to compete well, but ultimately, he will capitulate to Murray. The Scot moves on. The top half of the draw is headlined by the Battle of Belgrade and the bottom by the Battle of Barcelona. This matchup will be largely determined by Nadal's form. He holds a 13-4 head-to-head advantage versus Ferrer in their career meetings and even the four losses were at points when Nadal's form was questionable or worse. That said, we don't know exactly how well Nadal is playing at this US Open, he survived David Nalbandian, but Ferrer is a few steps up from the fading Argentine. I wouldn't read this as "Ferrer can only win if Nadal is injured," I would read it as "If Nadal has less than his best game, Ferrer can certainly take advantage." I've seen enough from Nadal to believe that he'll be tested, but ultimately, will get through. Potential fulfilled vs. potential unrealized could be the subtitle of this match. After years as an "almost" champion, Novak Djokovic has turned into a bonafide Hall of Fame credential carrying player, will Tsonga find inspiration in it? Can he stay healthy long enough to fulfill his long-held promise? Will it matter on this day? Djokovic is, for all intents and purposes, just a better player than he was a year ago, but as he's racked up 60 victories this year, does his own body and will still have more to give? This will be the biggest challenge Djokovic has faced on the road to the US Open title and it will certainly be stern. On the other hand, if Tsonga makes this stage, he'll be trying to back u his third win in a row over Roger Federer. Even a couple years removed from his Olympian best, beating Federer is still pretty heady stuff, ergo a letdown is in order. That slight crack should be all Djokovic needs to reach his third major final of the year. The better matchup of the semis for sure, Nadal holds a 12-4 head-to-head over Murray, but, and it's a Kardashian-esque BUT here, every Murray victory has been on a hardcourt. There's a point where if he wants to win his 11th major and 2nd US Open, Rafael Nadal will have to step up. His match with David Ferrer in the quarters is one, his match with Murray will require yet another. Murray has shown inconsistent form this tournament as well, barely escaping versus Robin Haase in the 2nd round and then suffocating a disinterested looking Feliciano Lopez in the next. Considering the challenge of the truncated schedule brought about by the weather and the fact that both men are going to have to go up a notch to win here, I am putting my chips on Nadal. Until his recent Djokovic-inspired hiccups, Nadal was the player most frequently mentioned in the "play for your life" scenario, an unflappable, tenacious competitor who won with grit and guile. Against Murray, I have to believe, Nadal will play less timid ball and find his way back to the final. Initially looking at the draw, I thought Mardy Fish, with a head of steam from his breakthrough summer, would find his way past Djokovic and into a final only to fall short at the last hurdle. Obviously, Fish is no longer with us in Flushing. It looks as if, at least once more this year, we'll get to see whether or not Djokovic can keep his win streak intact versus Nadal. Momentum is a cruel mistress and I find myself drawn back to a Nadal quote from early 2010 I believe, I'm paraphrasing, but the gist of it is "I keep making the semifinals, finals, eventually if I keep doing that, I'm going to give myself the chance to win." 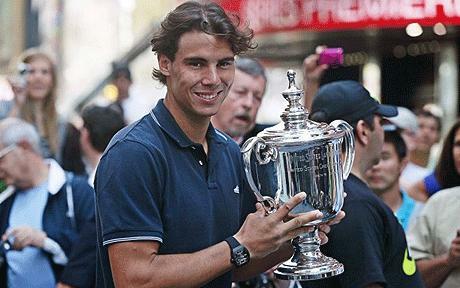 Nadal has dropped five consecutive finals to Djokovic. Every time we thought we had found the next lead narrative for the men's tour over the past couple of years someone changes the game. We went from "Federer stakes his claim and will win for years" to "Del Potro is going to break the Fedal hegemony" to "Wait, Nadal actually might be the greatest ever" to "Djokovic is having the greatest year ever" in the span of just two years. If the momentum changes on Monday, when I predict they finally get this final played, I wouldn't be surprised. And I wouldn't be surprised if it's Nadal who changes it. The diamond on this watch is a combination of covered and finished replica watches uk steel. This watch includes a choice of a black, silver or yellow switch and costs under. Gucci watches and Longines watches are one or two hours recognisable names in every home along the country. High quality materials make up the latest fashionable breitling replica sale, modern day diamonds are incorporated in the watches, through engineering and scientific processes, and the effect is watches that have strength and durability while staying beautifully stylish. Apart from men’s tie and jewelry, you can also add other accessories like socks, stylish cufflinks, and glass wear, watches which can complete your attire and make you look stylish. Other than buying good hublot replica sale fashion accessory for yourself, you can also gift them to your other male friends who would be happy to add them to their wardrobe. So now one can purchase anything from small clothing wear to fun gifts, shoes to Korean style accessories, and stationary items to cosmetics, all in this omega replica uk. Fashion today is all about wearing quality diamond watches; hublot replica sale can be a band, or any favourite item of diamond watches.